The primary role of Claud Elliott Creek Ecological Reserve is to protect undisturbed old growth montane forest communities on northeastern Vancouver Island. These forest types are some of the most wide-spread on central and northern Vancouver Island and much of it has been altered by logging. Major dominant trees in order of abundance are western hemlock, amabilis fir, western redcedar, and more rarely Douglas-fir. The most common communities that this ecological reserve protects are 1) western hemlock – amabilis fir- oval leaved and Alaskan blueberry – trailing raspberry – moss, 2) western hemlock – moss, and (3) western hemlock – western redcedar – amabilis fir – blueberries and false azalea – queen’s cup – moss. As outlined in the Protected Areas Strategy, a goal for the protected areas system is to conserve examples of British Columbia’s natural heritage. Although it is small in size, Claud Elliott Creek Ecological Reserve offers protection of the under-represented Coastal Western Hemlock vm1 biogeoclimatic variant and the under-represented Northern Island Mountains Ecosection (NIM). Much of these types of ecosystems have been impacted through forestry and are no longer in their natural state; therefore, any protected area that contributes to their protection may be considered important. Claud Elliott Lake Park is contiguous with part of the ecological reserve area, which adds to the conservation and representative value of Claud Elliott Creek Ecological Reserve. The secondary role is to protect wildlife habitat. The ecological reserve protects critical deer winter range in the Tsitika Valley and is potential habitat for wolf, cougar and Roosevelt elk. 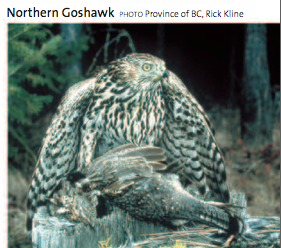 Along with Claud Elliott Lake Provincial Park, the ecological reserve serves as important breeding and foraging habitat for a red-listed subspecies of northern goshawk. Undertake an inventory of wildlife, rare and endangered species, and their habitats in conjunction with Claud Elliott Lake Park. Work with Ministry of Forests and forest companies to ensure that the ecological reserve values are considered a priority during forestry development. Representative Ecosection: Contributes minimally (0.46%) to the representation of the Northern Island Mountains Ecosection, which has only 9.12% protected. As the ecological reserve is adjacent to Claud Elliott Lake Park, it is part of a larger protected area that adds to ecosystem representation. Contributes minimally (0.15%) to the representation of CWHvm1 which has only 7.01% protected provincially. It makes an insignificant contribution to CWHvm2 which has only 8.72% protected. Other Management Considerations Part of a system of ecological reserves on Vancouver Island and in British Columbia. Connected to Claud Elliott Lake Park, which offers opportunities for recreation. Vulnerability Small size limits ability to manage for ecological integrity. Adjacent forest development may impact conservation values. Relationship to other Strategies This site was one of six identified in the Tsitika River drainage by the Tsitika Planning Team in the 1970s. The ecological reserve was created as a result of recommendations made in the Vancouver Island Land Use Plan.